First of all I must thank David Harris and his excellent blog Blue Book Balloon for my copy of Fellside, which I won in a giveaway from him. David's blog is well worth a look, particularly if you read crime, thrillers, fantasy, sci-fi and horror, and you can follow him on Twitter and Goodreads too. He sent me my copy of Fellside over a year ago but for some reason I've only just got round to reading it. 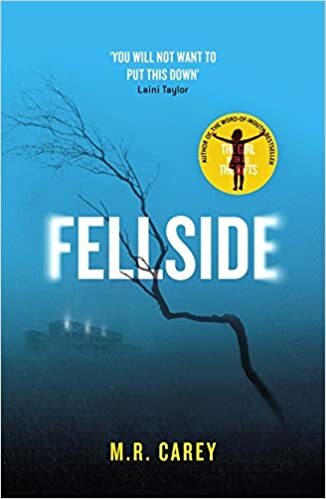 Fellside is the second novel by MR Carey, whose previous book The Girl With All The Gifts was a surprise bestseller that I greatly enjoyed and which was also made into a film. Like The Girl With All The Gifts, Fellside is a horror-tinged thriller, but a thoughtful and sensitively-written one despite its sometimes violent action sequences. I'd rather not make a distinction between 'literary' and genre fiction, but those who do might well consider Fellside to be a combination of both. Serving time in Fellside, a privately-run prison on the Yorkshire moors, Jess Moulson is consumed with guilt and self-hatred after setting fire to her flat under the influence of heroin, apparently in an attempt to kill her boyfriend but accidentally causing the death of Alex Beech, a lonely little boy living in a neighbouring apartment and whom she had previously befriended. One night, Jess is visited by Alex's ghost, and soon finds that with him she can walk through not only her own dreams, but through those of other prisoners too. Desperate to know the truth about what happened on the night of the fire, Jess starts to work with Alex to find out once and for all whether she really is responsible for his death - but in the meantime, she also has to survive the endemic violence and corruption of Fellside itself. There are many things to recommend about Fellside. The characters are vivid and convincing, with the prison itself close to being a character in its own right. Jess, despite her very many faults, is surprisingly easy to support, and MR Carey writes with an elegant clarity. However, most of the horror in this story comes not from the supernatural elements but from Fellside's realities, and for this reason I struggled to engage with this book for the most part. While I was absolutely on board with Jess's quest for the truth, aided by ghostly Alex, I couldn't keep up my interest in Fellside itself and its people and mythologies. In general, I tend to find stories of violent criminal underworlds tiresome and as such my interest in top dog Grace, corrupt screw Devlin, weak-willed prison doctor Salazar and damaged, unpredictable Lizzie just wasn't there, and I couldn't bring myself to care about the machinations of Grace's drugs empire. Devlin and Grace are caricatures drawn from every prison drama you've ever seen and Lizzie and Salazar failed to convince. There were times when I found myself forgetting which of the supporting characters was which, and this is never a good sign. The pace of this book also seemed slow to me, and by the time the story reached its conclusion, I found I didn't much care how it ended. Fellside isn't a bad book by any means, and having enjoyed The Girl With All The Gifts so much I would still read more by this author, but this one, despite its early promise, wasn't for me.